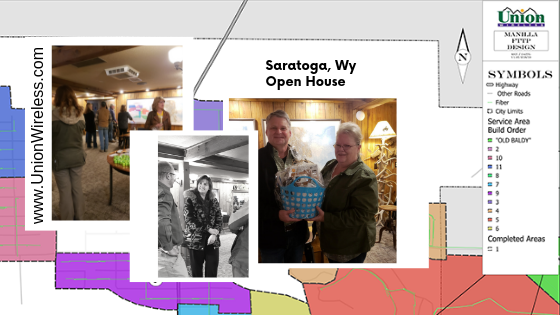 On March 21, Union Wireless hosted an open house for the Saratoga, Wyoming community to introduce the new broadband expansion plans in the area. Employees from Union Telephone socialized comfortably with the crowd, answering questions and learning first hand the needs and hopes of the community. Employees in attendance from Union were Carl Smith: Director of Marketing and Advertising, Annie Meeks: Corporate Sales, Patricia Kirby: Engineering, Lynda Sidwell: Community Engagement Manager, Wes Haas: Technician, Aaron Saeger: Operations Supervisor, and Matt Myers: Operations Manager. The friendly atmosphere grew as a prize was given, light refreshments enjoyed, and a realization of what was soon to come to Saratoga understood. A large map was hung explaining the expansion plans, with each colored area designating a new proposed phase. “There was a sense of excitement among those that attended,” stated Lynda Sidwell, “We had a decent turnout, 50 to 60 people-- everyone left with their questions answered.” With the snow finally melting and the ground beginning to thaw, construction has begun once again. The open house buzzed with information as guests and employees mingled. "The residents of Saratoga will have the best available speeds in the state," Sidwell continued, “Union is glad to continue the tradition of serving their neighbors in the tucked away towns of the Rocky Mountains.” With the advent of broadband in Saratoga, the world will soon be coming to them. For more information on when broadband will be coming to your area, visit www.UnionWireless.com.